Includes one weight plate of specified weight. 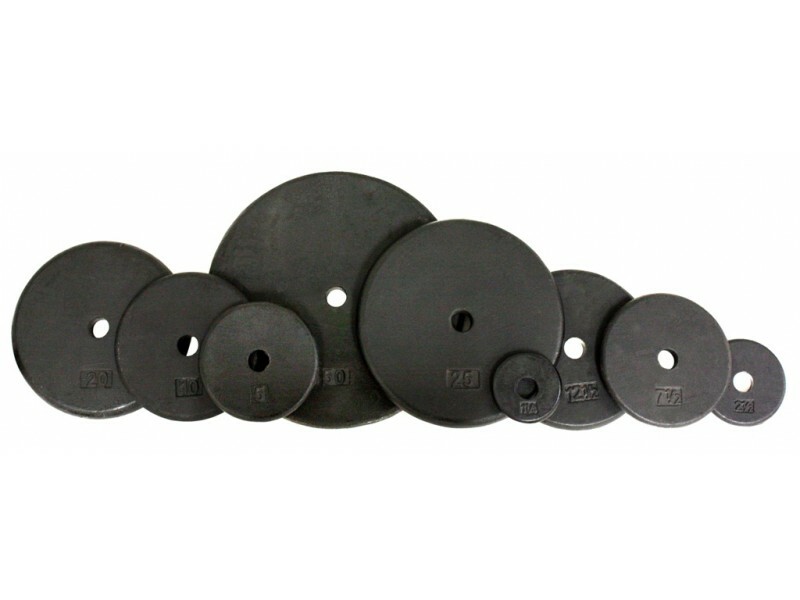 These "pancake style" black weight plates are ground completely around the edge, leaving a smooth, round edge that's safe for the user and floor. They will fit on any bar or dumbbells handle that is 1" diameter. The weight plates are coated with a durable satin black enamel paint and baked for one hour to assure a finish that is chip and corrosion resistant. You can also use these for assembling pro-style dumbbells. 1.25 lb 3 15/16" 7/16"
2.5 lb 4 15/16" 9/16"
5 lb 6 7/16" 11/16"
7.5 lb 7 7/16" 3/4"
10 lb 8 3/16" 13/16"
12.5 lb 8 15/16" 7/8"
20 lb 9 7/8" 1 1/8"
25 lb 11 3/8" 1 1/16"
50 lb 14 1/2" 1 3/16"